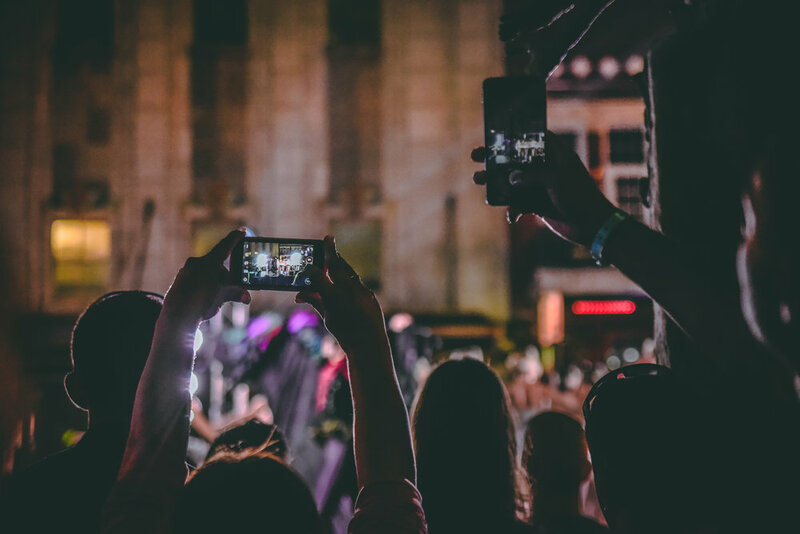 In a digital age, audiences are hungry for live experiences. But, it's at the intersection of digital and live experiences where the power lies. Photo : Audience members capture the Orlando Ballet performance, sponsored by Orlando Health, at IMMERSE 2017. The Creative City Project all about creating meaningful shared experiences; whether that's with art, architecture, or a brand. In this series of articles, I want to share with you some of the things we've learned along the way. Orlando Health, a $2.5 billion healthcare institution in Orlando, was one of our strategic partners in 2017. Here's how we combined a digital campaign with an epic live experience to create powerful brand engagement. Our Creative City Project team created a campaign called "The Athleticism of Art." The campaign would feature two dancers from Orlando Ballet in a 60 second art-centric spot that highlights the health and wellness aspect of dance. In collaboration with the Orlando Health team, we decided on the look and feel of the campaign. Our Creative City Project team then created a 60 second spot with two dancers from the Orlando Ballet. We also conducted, shot, and included excerpts from an interview with one of Orlando Health's Orthopedic Doctors. We used behind the scenes photos and video to tease the coming video release on the Facebook and instagram accounts of the participating artists, organizations, and filmmakers. Before the paid campaign even launched, the teaser content reached more than 100,000 impressions. Along with Orlando Health, we defined audiences to deliver the content to. The highly creative nature of the work helped position the content in the eyes of the viewer – not as an "ad" – but as a viewable and shareable asset for high engagement and an even broader reach. The copy of the campaign invited viewers to join us at IMMERSE 2017 where Orlando Health helped present the Orlando Ballet performing live experts from their upcoming "Swan Lake." LIghted gobos provided a visual brand presence, and recorded audio announcements before and after each performance reinforced the partnership. The Creative City Project team of professional photographers and videographers captured the live performance. Those images are being shared for the following year as follow up content on social channels. These digital and live elements combined to create a compelling, art-centric brand engagement that went beyond advertising collateral and into the realm of shareable, meaningful content. It's this kind of value-add content that truly engages audiences for a meaningful and memorable experience.